Zamfara State Police Command, yesterday, intercepted two vehicles carrying arms in different parts of the state. Spokesman of the Command, Mr. Muhammad Shehu, told newsmen in Gusau, yesterday, that items recovered from the vehicles were three AK-47 rifles, an automatic pistol, locally-made pistol, magazines and live ammunition. 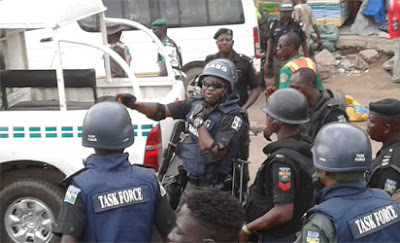 According to him, other items recovered include N103,435, ATM card, three voters’ cards, military camouflage and a stamp of the Cattle Traders Associa-tion of Nigeria in the Bukuru Local Government Area of Plateau State. Shehu said the drivers of the two cars, a Honda Civic marked Sokoto State, BDN358AA, and another marked Kano State, KMC 321AA, were arrested and are assisting the Police investigations. The suspects Shehu explained that a Police patrol team arrested one of the suspects, a native of Birnin-Yero village in the Shinkafi Local Government Council of Sokoto State on September 25 on the Gusau-Sokoto Highway. He named items recovered from the vehicle as two AK-47 rifles with number 3745485 and 1977CK22457, respectively, and five magazines with 165 rounds of live ammunition. He added: “Other items recovered are N68,750 cash, ATM card and three voters’ cards, military camouflage and several mobile phones.” He said the other driver, a native of Bassa Local Government Area in Plateau State, was arrested on the Kauran-Namoda-Jibiya Road. Shehu said that exhibits recovered in the man’s vehicle were one AK-47 rifle with number 804151, two magazines with 20 rounds of live ammunition and one pistol with four bullets. “Other items recovered are a locally-made pistol, eight mobile phones, N34,685, military uniforms and a stamp of the Cattle Traders Association of Nigeria, Bukuru Local Government Area of Plateau State,” he added.